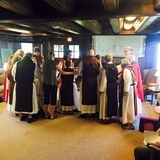 The Lindisfarne Community has been in process of development since the late 1980s, when its founding Abbess and Abbot came into contact with Celtic Christian spirituality with a group of church leaders, Northumbria Ministries, in the North East of England. At the time Andy Fitz-Gibbon was pastor of Stocksfield Baptist Church, Northumberland. • "In Christ Ministries" began as the outreach ministries of the church (writing, seminars etc) around 1990. In 1993 ICM Inc was established as a 501(c) Not For Profit Corporation in New York to help facilitate their work in the United States. • ICM Trust set up as a charitable trust in the UK. • In 1994, after ten years ministry at Stocksfield Baptist Church and with the blessing of the church, Andy was seconded by the Baptist Union of Great Britain to explore the idea of Christian community based in homes, looking at patterns in the New Testament and beyond. Jane joined Andy as co-director. A new community was begun in Hexham Northumberland. • In 1995, the Fitz-Gibbons moved to Ithaca NY and established a new home based community and a ministry of spiritual renewal. • In 1998, the community became known as "Community of Friends in Renewal." • Community . . . the idea of intentional, face-to-face church, small, home-based. • Friends . . . at the heart of who we are is the practice of "godly friendship." The community is a network of friendships. • In Renewal . . . exploring a deep spirituality. • In 1998, Jane was formally ordained at an ecumenical service in Ithaca NY. • In 2001, the community was chartered as a jurisdiction in the one holy, cathloic and apostolic church by by Archbishop Wayne Boosahda of the Archdiocese of St. Patrick, Community of Evangelical Episcopal Churches. Jane and Andy Fitz-Gibbon had their ordinations reaffirmed as they were ordained priests and appointed Abbot and Abbess, "apostolic overseers" of the community. The first four deacons of the community were also ordained by Archbishop Boosahda. • In Spring 2003 it was agreed by the Board of ICM Inc that the name "The Lindisfarne Community" be the working name of the community. 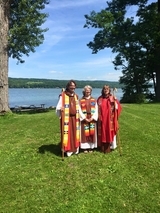 • In June 2003, Andrew and Jane were both consecrated bishops in apostolic succession by Archbishop Wayne Boosahda (the CEEC), Archbishop Joseph Grenier (Celtic Christian Church) and Archabbess Charlotte Rogers Buckans (Anglican Catholic Communion, USA). Since then, the Lindisfarne Community has continued to evolve and grow as new members have joined us and we have received new insights. We are an inclusive and affirming community welcoming all who join our quest for a deep spirituality lived in the world. • The Anabaptist radicals of the sixteenth century, those at the time of the Reformation who practiced their faith "against the flow." They valued community, peace and radical commitment. They had a dynamic spirituality. The Wesleyan movement in the seventeenth century had similar values with regard to discipleship and small groups. • The Celtic Christain emphases of the fifth to ninth centuries in Britain and Ireland. Here was a less hierarchical spirituality that valued prophecy, the arts, music, poetry, had a healthy view of the goodnesss of creation and affirmed women in ways the church has rarely done. • The monastic movement of the desert and the early middle ages. The Celts led us to look again at the spirituality of the desert fathers and mothers and the later development of monasticism. • The Christian feminist movement of the last quarter of the twentieth century. We believe that the movement has helped the church to consider again the radical, embryonic potential of freedom found in the gospels and in Paul's early charismatic practice. • The charismatic movement of the latter half of the twentieth century and a rediscovery of spiritual gifts, new forms of worship and the dynamism of the Holy Spirit. • The Convergence Movement synthesizing sacramental, evangelical and charismatic emphases. • Diverse spiritualities and practices from eastern traditions, Buddhism, Daoism, Hindusim, and Sufism. • The movement to affirm and include LGBTQAI.